After over 35 years in federal prison on charges of conspiracy and sedition, political prisoner Oscar López Rivera, 73, will be released on May 17, 2017, thanks to an 11th hour commutation by President Barack Obama, El Nuevo Dia reports. Rivera, a beloved member of the Puerto Rican National Liberation Armed Forces (FALN), has gained supporters all over the world. Puerto Rican freedom fighters, organizers and activists have led the push for Rivera’s freedom, including his close friend and mentee Rep. Luis V. Gutiérrez (D-IL). I am overjoyed and overwhelmed with emotion. Oscar is a friend, a mentor, and family to me and he and his brother José have been friends and mentors for my entire adult life. There were times when hope was hard to find but my wife Soraida always had faith that this day would come. Now it is clear that Oscar will rejoin his family and be able to walk free among the Puerto Rican people. Thank you, President Obama, thank you on behalf of millions of Puerto Ricans on the Island and around the world. Thank you from Oscar’s family and friends in Chicago. The international campaign of religious leaders, elected officials, Nobel Prize winners, and ordinary people of faith and good conscience has led to this day. We have had our prayers answered. The long fight against colonialism in the Caribbean has had many chapters and we have all put violence behind us. 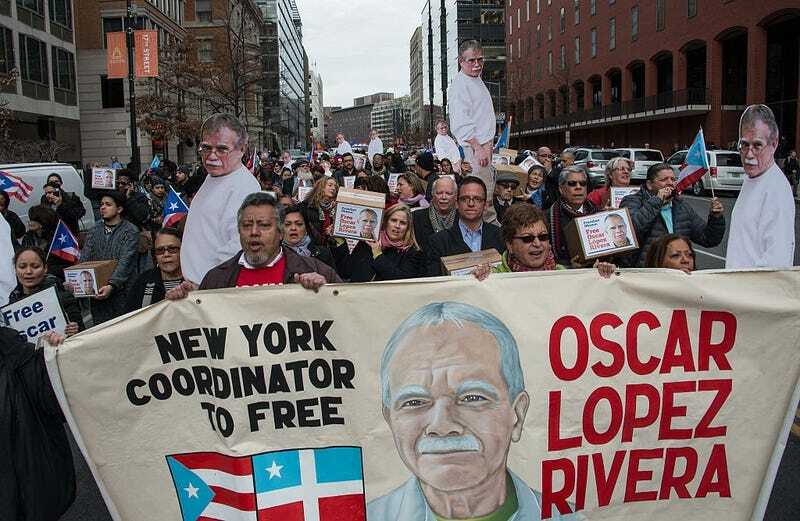 Releasing Oscar Lopez Rivera back to his homeland and his people is a step towards peace and reconciliation and is being celebrated by Puerto Ricans of all political stripes, classes, colors and geographies. He is a national hero no less significant than Roberto Clemente or any leader we have ever had. It will be a blessed day when I can walk and talk with my friend in the fresh air, far from prison walls, and I am so looking forward to that day. Rivera, a resident of Chicago, fought tirelessly for Puerto Rican liberation and activists have been pushing for his release. Though pressure has been placed on President Obama to release Rivera, the news today was still met by many people with stunned disbelief and relief. President Obama signed the paper but we the people, la gente, our collective struggle FREED OSCAR LOPEZ RIVERA!!! In addition to Rivera, political prisoner Chelsea Manning’s sentence was also commuted. As previously reported by The Root, Manning was arrested in 2013 and sentenced to a 35-year sentence at the military prison at Fort Leavenworth in Kansas for blowing the whistle on vast human rights violations orchestrated by the U.S. government and carried out by the U.S. military. She recently went on a hunger strike, citing lack of proper medical treatment and “high-tech bullying.” Manning, who is transgender, has been denied hormone therapy and has repeatedly attempted suicide in an attempt to escape her inhumane environment. Manning will be released May 17. Obama did not commute the sentence of political prisoner Dr. Mutulu Shakur, member of the Revolutionary Action and New Afrikan Independence Movements—and stepfather of iconic Hip-Hop artist, activist, and actor Tupac Shakur. He also did not commute the sentence of Indigenous rights activist Leonard Peltier. Organizers and activists have been fighting diligently for the release of both Shakur and Peltier. Upon hearing the news of Rivera’s and Manning’s commutated sentences, there have also been calls to free revolutionary Mumia Abu-Jamal, who is serving a life sentence in prison for the 1981 murder of Philadelphia Police Officer Daniel Faulkner, Obama does not have the authority to commute his sentence as it is a state level offense. As previously reported by The Root, a federal judge recently decided that the Pennsylvania Department of Corrections should provide Abu-Jamal with new medications to treat his hepatitis C infection. “The government hasn’t abandoned their plan to kill Mumia,” said freedom fighter Ramona Africa, a MOVE member and survivor of the 1985 police bombing that killed 11 MOVE members and left hundreds of people homeless. “They’re just doing it in a different way,” Africa said. There have also been calls for President Obama to commute the sentence of freedom fighter Assata Shakur—who is still safely in Cuba after escaping from prison in 1979 and seeking political asylum in the island nation. Shakur, the godmother of Tupac Shakur, was a member of the Black Panther Party and Black Liberation Army, and the first woman placed on the U.S. “Most Wanted Terrorists” list. She was falsely convicted of the May 2, 1973 killing of New Jersey state trooper Werner Foerster. The state of New Jersey added $1 million to the FBI’s $1 million reward for Shakur’s capture. While Obama has maintained the “hands off” policy that the United States has taken toward Shakur, he does not have the authority to commute her state sentence. Obama’s decision to commute Rivera’s and Manning’s sentences should be applauded, but there is still much work to be done.